This union of opposites pairs Sun in Scorpio’s focus on power with Moon in Taurus’ need for stability. But somewhere in the middle, these Fixed signs both want an enduring relationship. They may view it from different angles, but their complementary approaches can work together to create a long-lasting partnership. Sun in Scorpio wants power. Sometimes (if he’s expressing his Shadow) it’s power for power’s sake. But usually it’s the power of total intimacy. Sun in Scorpio doesn’t feel safe until he’s been inside someone (literally and metaphorically). No secrets means no surprises (Scorpio hates surprises). His partner must have a high tolerance for his brand of intimacy, while respecting his sacred boundaries. 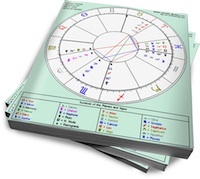 Once Scorpio’s trust has been won, he can be a fiercely loyal and loving partner who is there, one hundred percent. But when he needs time to himself to brood, recharge or explore his latest obsession, his lover must respect that. The quickest way to break Scorpio’s trust is by stepping over his boundaries. Moon in Taurus needs consistency. Her sensual, nurturing energy is rooted in the absolute certainty that domestic routines (and her partner’s loyalty) are sacred. She is capable of change, but it must be gradual, and on her own terms. The quickest way for her lover to shut Moon in Taurus down (and risk being locked out of her heart) is to spring a major change on her and state that she must comply. Shadow Taurus can stagnate, remaining stuck in an unhealthy habit due to fear or resentment. Sun in Scorpio will respect Taurus’ immovable determination, and Moon in Taurus will feel safe with Scorpio’s reliability. She’ll be able to stand up to him if he attempts a power trip, and he’ll figure out how to coax her into a new routine. Although the occasional battle of wills is to be expected with these two enormously stubborn signs, they should have no problems maintaining a solid relationship.